Wow. Who would have thought that there would be one of these in the US? 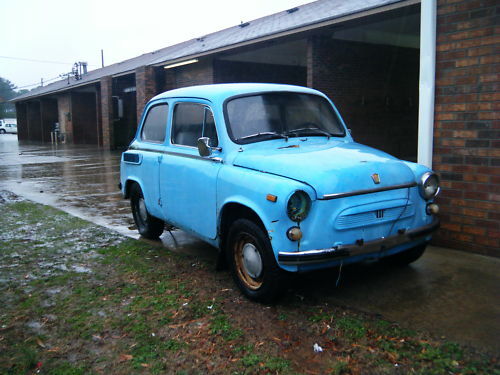 The ZAZ-965 Zaporozhets was built from 1960 until 1969. It was an original design, although it's a pretty good bet that the folks at Moskvitch (who designed the car) had taken a good long look at a Fiat 600 before they put pencil to paper. Like the Fiat 600, the engine sat in the rear of the ZAZ-965. 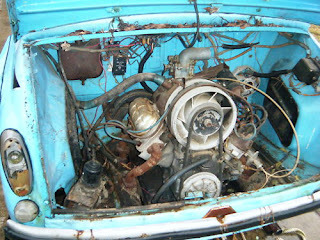 The engine is an aircooled, 746 cc, 26 HP, V4. Unlike the Fiat, the ZAZ-965 had a torsion bar suspension up front. Supposedly the ride is pretty comfortable for a small car. 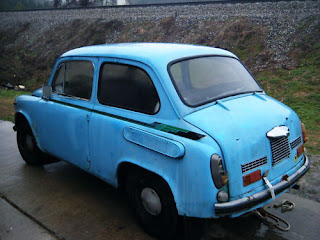 This was one of the cheapest cars you could buy in the Soviet Union. 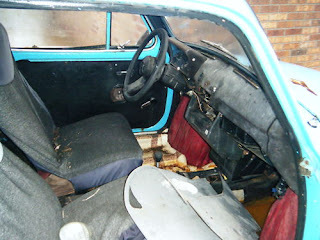 The interior is pretty spartan, but really no worse than many cheap Western European or Asian cars from the same era. The seller doesn't say how or when this car arrived in the US. From what I can gather from the listing (which is pretty confusing) it somehow found its way to Georgia from Maryland. It has some "rust issues", which the seller attributes to it being an "up north car". He also says the engine turns over but doesn't run. I have no idea what these cars are worth. I suspect it's not a lot. Based on the pictures, this one needs a lot of work. But, if you can buy it cheap and you don't mind waiting for parts to arrive from Eastern Europe (Unlike Lada, Skoda and a few other Eastern European cars, these, to the best of my knowledge, were never sold outside of Eastern Europe. They were most certainly never sold in North America) this would be a really cool car to restore and bring to shows. Located in Winder, GA, click here to see the eBay listing. They were sold in some Western European countries as the Yalta.